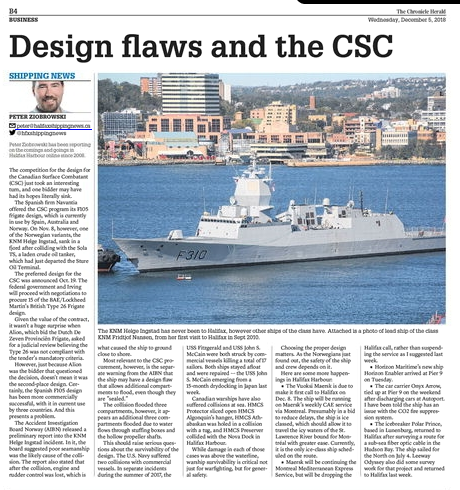 Post media is reporting that DND has concerns about the type 26 potentially having power and propulsion problems due to similarities with the British type 45 – which has issues. Naval today has an illustrated guide to warship salvage. – or How they will raise the Sunken Norwegian Frigate. In typical European fashion, they will use a large crane. Private SAR helicopters are a possibility – and frankly a good idea to augment CAF service. I love this infographic for the Port of Vancouver. BTW, our shipspotting 101 series goes into way more detail on various types of ships that call in Halifax. Dec 4, 1933 – Leading Seaman John Pully from HMCS SAGUENAY is buried at sea following his death on 30 November 1933 from leukemia. His burial off Halifax is considered the RCN’s first burial at sea. Dec 3, 1969 – During HMCS BONAVENTURE’s final cruise, 2 sailors died when they entered an AVGAS tank that was not fully vented, 2 sailors that attempted to save their shipmates were also killed. Nov 30, 1835 – Mark Twain, was born in Florida, MI. He worked as a pilot on Mississippi steamboats before becoming a writer. Mark Twain is a pen name, taken from a command used while sounding the river with a lead line. Nov 28,1787 – Bligh departs spithead on his fateful voyage abroad the bounty. This entry was posted in Weekly News on December 5, 2018 by Peter.